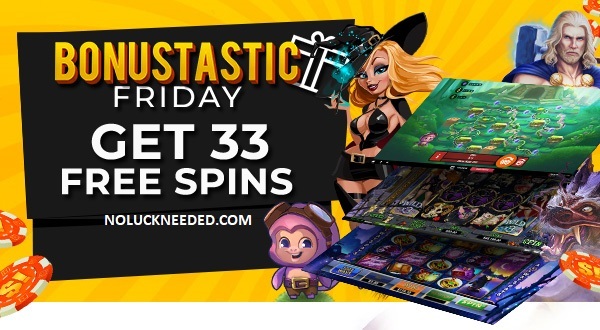 Get 33 Free Spins on Friday at Slotastic Casino! Friday will be here soon and Slotastic Casino gives you 33 reasons to celebrate! How do you get your weekly 33 free spins reward on Friday? Deposit in the current week between Monday and Thursday to qualify and your coupon will be delivered to your 'Messages' on Friday. Redeem the coupon and spin the reels of your favorite slots to win up to $180. While you are at it, don't miss the Slotastic and NoLuckNeeded $400 February Private Freeroll. GOOD LUCK! How to get your weekly reward? 1) Deposit in the current week between Monday - Thursday. 2) Your coupon will be delivered to your 'Messages' on Friday. 60X Wagering Requirement; Probably $180 Maximum Cashout. Standard bonus terms apply. Max bet rule. Do not claim two free bonuses in a row. Spins Game: Samba Sunset; *The 50 Free Spins promo code is valid for new and existing NoLuckNeeded.com affiliated players. *Players are not allowed to use two free bonus coupons in a row. 60X slots wagering; Max cashout: $180; $10 max bet. Get 33 Free Spins this Friday at Slotastic Casino! I am not sure if the 33 free spins promotion is available today. Did anyone receive a code in the message center?